The Metropolitan Museum of Art relaunched their website recently, and for a history nerd like me it’s like getting a new toy. The Met has one of the best collections in the world and has done an impressive job of digitizing it. You can search the collection here, and find high-quality images of everything from shoes to swords to snuffboxes. 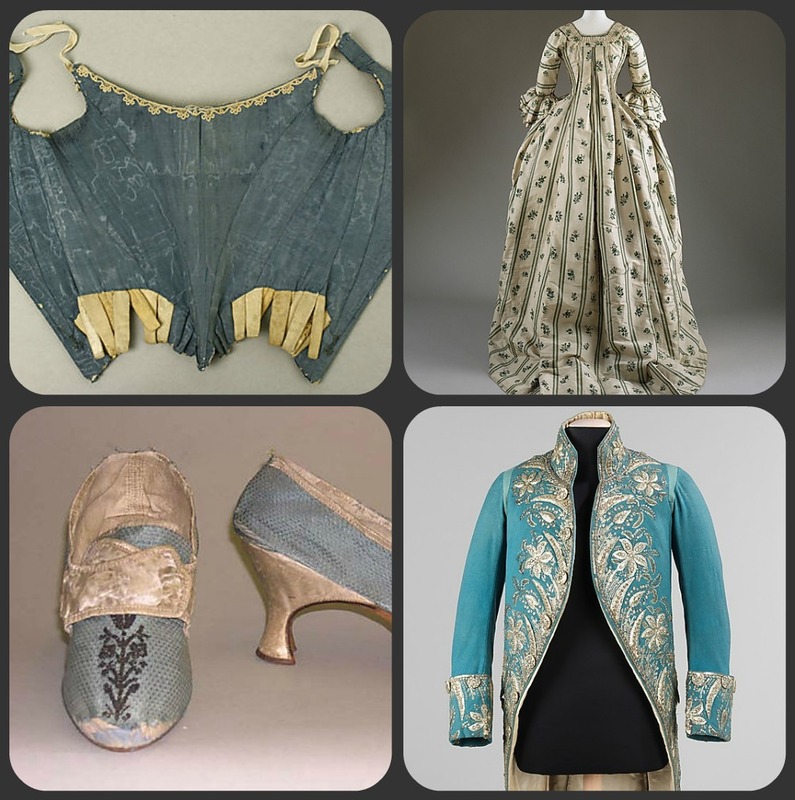 So far I’ve just been using it to do a little 18th century outfit planning (see, I even picked out a coat for my date), but I’m sure I’ll actually start doing more serious research soon. After I’m done looking at shoes. Blue ones, obviously. This lovely lady is wearing a particular type of bonnet, called a calash, that was popular in the late 18th and early 19th centuries. The calash was collapsible, so it could be raised or lowered using the ribbon ties. Apparently forward young ladies would snap their calash ribbons to attract the attention of a passing gentleman. How scandalous! Someone just fell down a few spots on the list of my favorite presidents! I can’t imagine that Abigail approved of the sentiments John Adams expressed in a letter to Elbridge Gerry in 1813. Read more about the personal grudge that may have been Adams’ motivation for writing such an untrue statement here, in an excellent post on the 18th Century American Women blog. I could write a lengthy blog post just on Lady Worsley, but instead I’ll just tell you to read the book “Lady in Red” by Hallie Rubenhold; it’s a juicy story complete with gossip, adultery, court proceedings, and a May-December romance. To view (or, if you’re like me, drool over) extant examples of 18th-century riding habits, click here, here, and here. And hopefully you’ll be inspired by the female fox hunter and refuse to let seemingly inappropriate footwear get in the way of your sporting pursuits! The artist has not given them the most manly-looking umbrellas, so they look a bit silly. 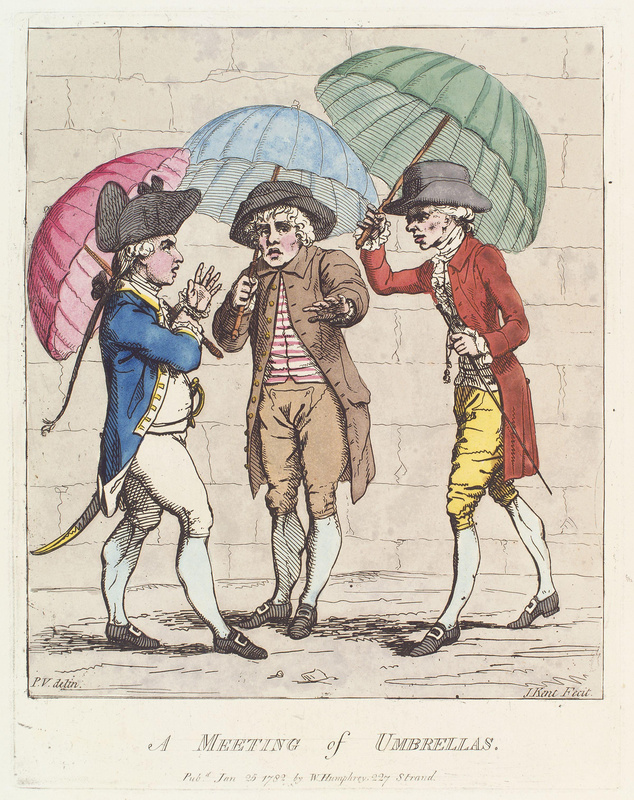 For much of the 18th century, only women were supposed to carry umbrellas. Apparently reverends and doctors could sometimes use this form of rain protection without ridicule, but other men were just supposed to get wet. Be grateful that times have changed gentlemen! This may be my favorite Friday Photo yet; I took it myself, from the cockpit of a plane I was flying. 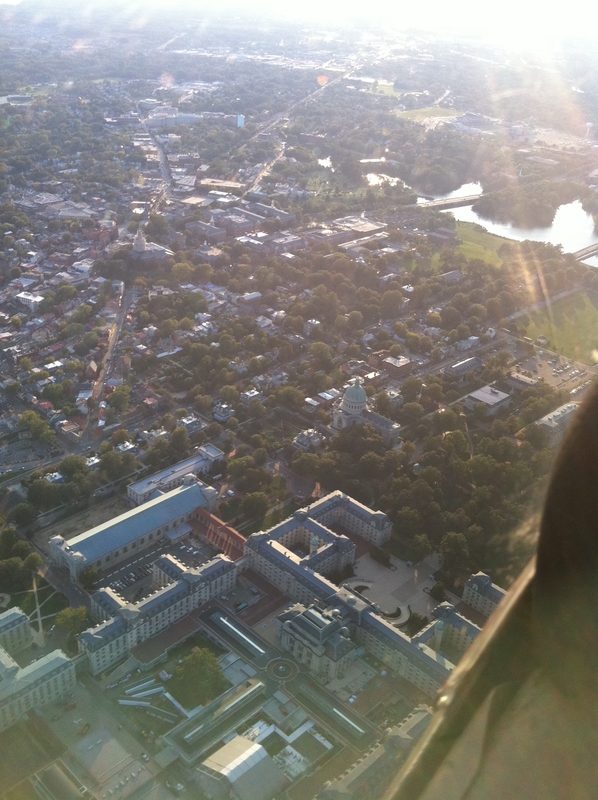 Don’t worry, the flight instructor took over the controls so I could take the picture.